The National Weather Service is reporting: As of 8 am: The Coast Guard has observed 20 foot or greater breaking waves at Noyo, Humboldt, and Crescent City - Safety zones now enforced. The National Weather Service is warning of hazardous ocean conditions today, with gale force winds early on and waves upwards of 30 feet predicted to pummel the shore. 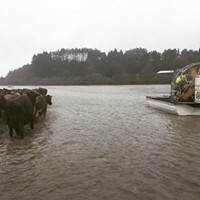 The high seas are expected to impact local crabbers, who were already hit with major delay for the recreational season. “The Humboldt Bay bar will likely close at some point due to the high waves on Thursday,” according to a NWS post. The large surf prompted the county to close Centerville Road, which is not slated to reopen until Friday morning. Read previous coverage here. 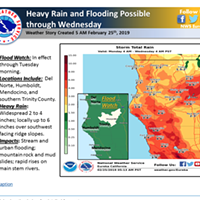 At this time, most major roadways are open in Del Norte, Humboldt, Mendocino and Trinity Counties. For up-to-date information, visit the Caltrans' QuickMap website here. 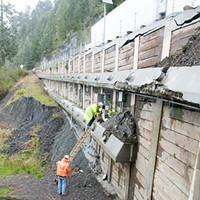 Flooding near Redcrest closed the Avenue of the Giants last night, according to a tweet from Caltrans District 1. “No estimated time to reopen at this time,” the tweet stated. Multiple residents report that there is roadside flooding and minor mudslides throughout the Avenue. 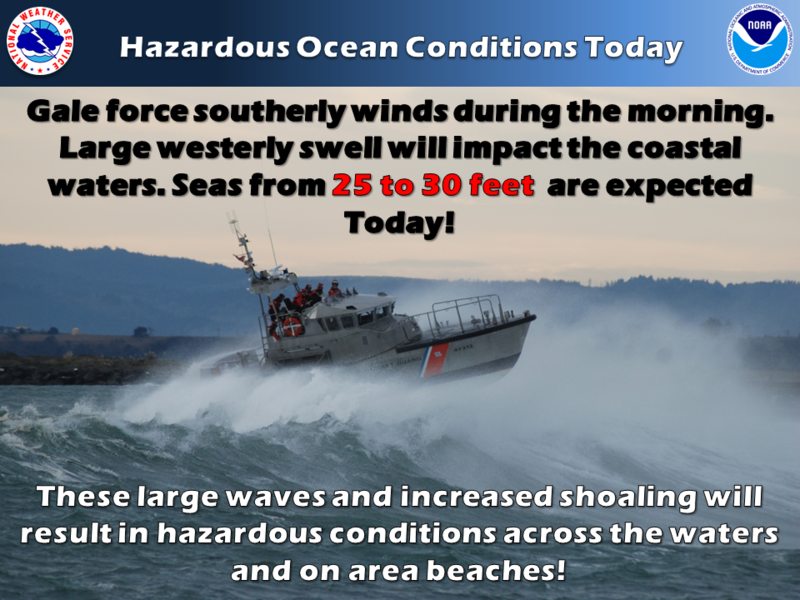 A strong storm system is expected to generate hazardous ocean conditions today across the coastal waters. As Gale force southerly winds diminish Thursday morning, a large westerly swell persist through Thursday evening. Significant wave heights are expected to reach 25 to 30 feet, which will lead to increased shoaling and an overall hazardous and chaotic sea state. Meanwhile, large breaking waves are also expected along area beaches, along with increased wave run-up in areas that are usually safe. Confidence is high that seas will become notably hazardous, and will likely impact local crab fishing operations and other marine interests. The Humboldt Bay bar will likely close at some point due to the high waves on Thursday.